Looking back, most people are going to remember the 07/08 season as the year it never seemed to stop snowing. While it wasn't quite a record for snowfall, another record is shaping up. Not that long ago there were only a small handful of parks in Utah, but now they are popping up faster than fixed gears on hipster kids. Since late last year, new cement has been poured in American Fork, Herriman, Payson, Rose Park and the newest in Midvale should be opened by the time you read this. Not to be outdone, Heber City is in the process of building one of the largest parks in the state�set to open in late July. Lehi, Kearns and West Valley City all have designs drawn up and are in various stages of planning. In the meantime, Eagle Mountain will sneak in and beat them all to the punch. Pay attention kids, the Copperview Rec Center Park in Midvale is a shining example of why it's important to get out and vote, even in small elections. A few years back there was an initiative on the ballot providing ZAP funds. The P stands for parks and some of those funds went to the construction of the Copperview park. This is also the same program funding the planned park in Kearns. Copperview is a 14,000 square foot park located at the newly renovated Copperview Rec Center located at 8446 South Harrison Street (a.k.a. 300 West) in Midvale. This one snuck up on a lot of people. There was a small groundbreaking ceremony last October, but progress stayed under the radar until the cement work was finished in early June. There's nothing groundbreaking in the design, but it still looks like a fun park. There's a 60/40 split of street plaza in the front and a midsize bowl with slight over-vert pocket in the back. Sorry bike guys, looks like you're not invited to this one. On the opposite side of the valley, Heber City is finishing work on what will be one of the largest parks in the state. 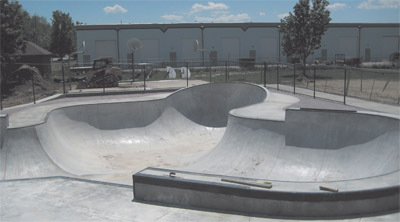 This marks California Skateparks' second project in the state (Herriman being the first) and is headed up by project manager Brian Pino. Pino was part of the crew who poured both Logan and the original Park City so he's been in the game for a while, plus he and a few others on the crew are ripping skaters. It's amazing how things turnout when you hire crews that actually skate. This one is going to be a monster too. There are four bowls��including a right hand kidney with pool coping and tile��a good mix of street features and some creative lines connecting them with two of the bowls. Expect a late July opening. Cities aren't the only ones in on the new construction, spots are popping up all over�in backyards, driveways, abandoned lots... everywhere. Go buy some cement or dig thru the dumpsters and get to work. It's amazing how sometimes a janked up spot you make skateable or build yourself can be way more fun then the most perfectly poured park.